I was lured out into the cold, sunny garden early this morning by Baptisia australis, selected as the 2010 Perennial Plant of the Year™ by the Perennial Plant Association. Baptisia australis 'Purple Smoke' has been a nice anchor at the end of the perennial border between me and my neighbor for many years. For awhile, I had some other plants growing around it that I thought were keeping it from reaching its full potential, so rather than move the Baptisia, which has a reputation for being a bit difficult to move, I cleared the space around it, and for the past several years, it has been outstanding. I remember last May when garden bloggers met in Chicago, the Baptisia growing in the Lurie Garden were at peak and caught the attention of many of us, so much so that when I got home, I purchased two more Baptisia. 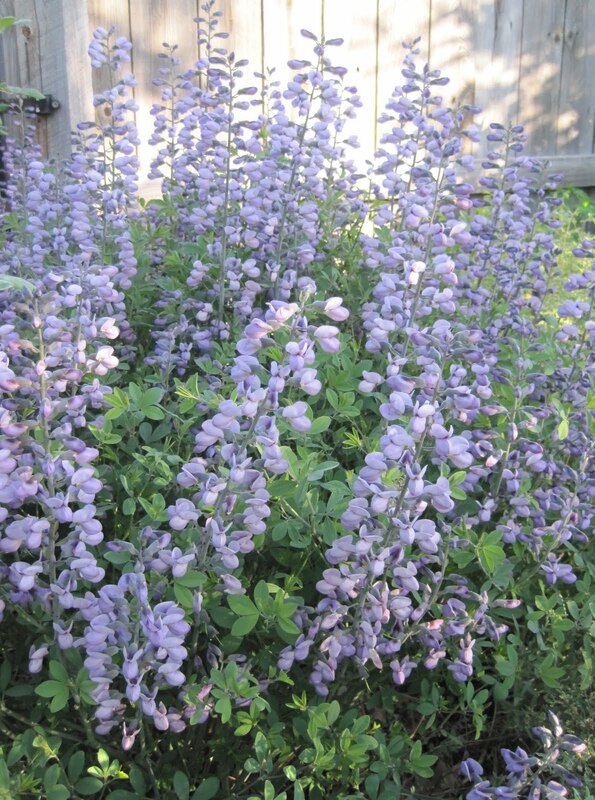 The first one was labeled as "just" Baptisia australis, and is a brighter purple than 'Purple Smoke'. It's just starting its second year in the garden so doesn't have as many blooms as 'Purple Smoke', which I've probably had for at least seven or eight years, maybe longer. The second one, in the middle of the border, is another example of my giving in to temptation at the garden center. Who wouldn't want Baptisia 'Carolina Moonlight' with yellow blooms? 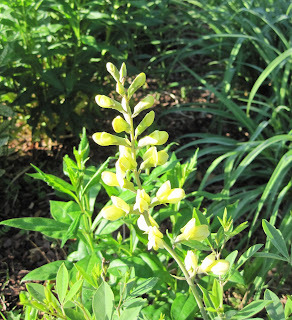 It's a hybrid cross between Baptisia sphaerocarpa and Baptisia alba. The tag said it is also long-blooming. Time will tell on that. Right now, with just two bloom stalks, it isn't exactly drawing the crowds. Baptisia is pretty easy to grow in the garden. It does best when you plant it in full sun, give it some room, and let it settle in for a few years. In other words, don't move it all around all the time. Find a spot for it, plant it, and enjoy it right there. Just by looking at the flowers, most people can figure out that Baptisia is a relative of the common garden peas. Both are members of the Fabaceae family formerly known as the Leguminosae family. 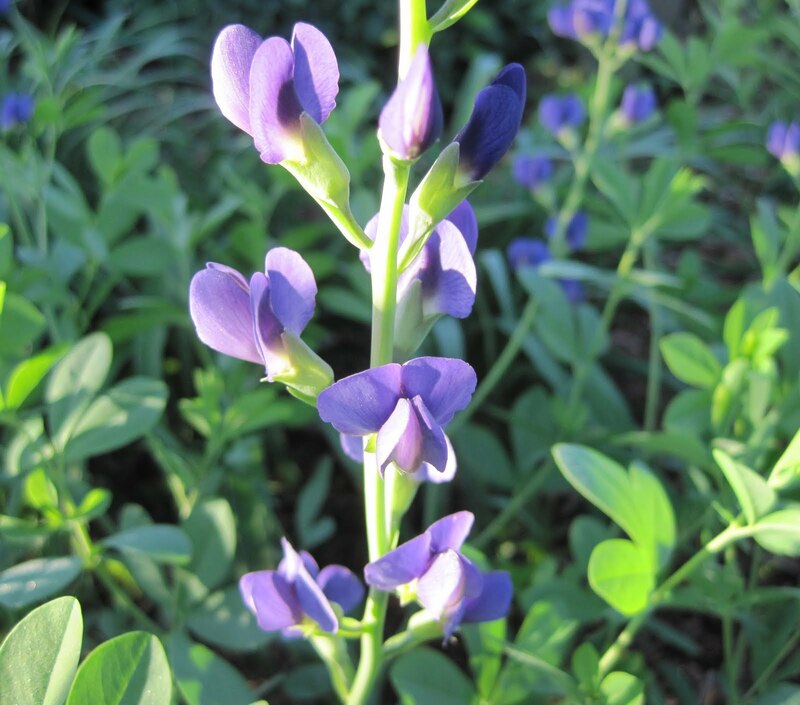 It also goes by the common name "False Indigo". I would call it that, and for many years did call it that, but a few minutes ago, I decided for no particular reason to not call plants "False" anything. Would anyone else like to join me in this crusade that I just dreamed up? Perhaps the Society should discuss it? They are due to meet sometime soon according to their self-appointed president for life. 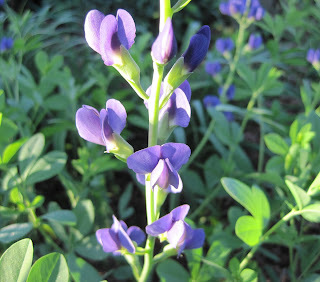 So there you have it... a few rambling thoughts on False Indigo Baptisia blooming in my garden on a beautiful, slightly chilly Mother's Day. I think I'll cut a few stems of 'Purple Smoke' and take them to my Mom when I see her later today. 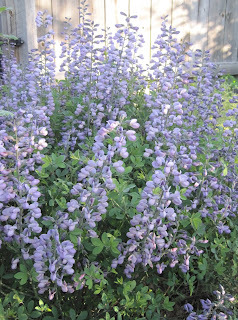 Plant some Baptisia in your garden and you can do the same next year (or the year after). I have many years to wait for my Baptisia show. They are all small and there was a mixed bag of return between seed grown, store bought and transplanted. How does one determine the best method when each had a 50% failure rate of spring return? I like your new idea; I don't like "false anything" either. I guess now I am going to have to look up the true name of False Rue Anemone. I have been wishing for a white Baptisia, but knowing its need for its perfect spot so it never needs moving, I have delayed. Now, having just typed that, I believe I have thought of the perfect spot. Enjoyed your post. That display would bring me out in the cold for sure. I can get behind not calling Baptisia by the name False Indigo. Especially since I first heard the term False Indigo applied to a bush in the Anza Borrego desert. I like the color of the species Baptisia australis and am planning to plant several in my new yard this year. Especially after seeing your big clump. Wow! I have a B. Twilite I purchased about 4 years ago now, and it hasn't done much for me. At first, I put it in a spot that I thought got more sun than it did, so last spring, I got up my nerve and moved it. It seemed fine. This spring, I had given up hope on it for its new spot, it's been so late, but I saw a little shoot coming up yesterday, so I'm hoping it comes back. My B. australis v. minor is a smaller and more dependable little darling. I'm still hopeful for the big guy, though. Thank you for the post. I really miss this plant from Kentucky gardening days. It did so well there. Was not a plant I'd grown up with but I saw it in Peggy Schmidt's beautiful garden (all blues and whites) and read about it in Ezra Haggard's Perennials of the Lower Midwest. The only negative I ever heard of was trying to get rid of it once it's established. But who'd ever want to do that? I have three Baptisia in three different parts to my garden areas. I bought them last year in June from my dad's favorite nursery in thte Kansas City 'burbs. I put each one where I wanted them per my dad's instructions so that they would have a steady, don't move me home. Each of them came back this year, but no blooms yet. Takes a bit of time here in Denver burbs of Colorado. I think mine are all yellows, but this year I'll be getting the blues. I bought a 'Carolina Moonlight' a few years ago. It does not seem to bloom as prolifically as the purples do. Then this year, one stalk had white flowers. I hope it doesn't revert to all white - it is planted in the Yellow Garden. Because of all the lovely photos of Baptisia growing at Lurie Garden, I planted it in my yard at the end of last summer -- 'Twilite Prairie Blues'. If it ever looks even a tiny bit like your first photo, I'll be thrilled. A delightful post on Baptisia - and I do like your first image. It is something that I have been toying with getting for the garden - so you have given me food for thought. I have two big Baptisia and a couple of smaller ones too. One of the big ones I grew from a seedling given me by a friend. I am with you about repudiating "false" in reference to any plant.